Juggle with your chosen object (balls and clubs are the usual items used). Now try juggling while walking about (backwards and forwards, zigzagging, turning circles in both directions, speeding up and slowing down) to get used to the idea of juggling while moving in various directions! If you cannot already juggle, try my 3 ball cascade page. Idle on a Unicycle. This is where your unicycle stays on roughly the same spot by rocking the pedals back and forth. This is an essential skill if you are a performer, as otherwise the audience will have to follow you on your journey as you entertain them, as you will have no way of staying in the same area! 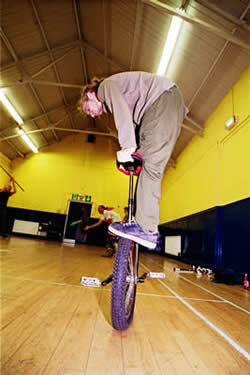 Try my Unicycle tricks page information and other tricks worth learning. You are now ready to put your Unicycling and Juggling skills together! If something goes wrong, then you should be able to work out whether it was your Unicycling or Juggling skill that was at fault, and be able to try concentrating more on that aspect of the trick or go back to practicing each skill separately. You may find it helpful to use a helper or a wall to begin with rather than learn this technique unsupported. To give you a visual idea of what needs to happen, your body needs to try and stay in the same place while the Unicycle wheel swings forwards and backwards underneath you. To achieve this, get comfortable on the seat, keep looking forward, then move the pedals forward and backward in a rocking motion. One foot needs to be on a low pedal and most of your weight should be powering this pedal as it has to swing like a pendulum. Your other foot needs to just rest lightly on the upper pedal. Once you have learned to idle with your stronger foot on the lower pedal, you then need to learn all over again with your weaker foot on the lower pedal. The reason for this is that you never know when you might need to idle and you won’t always be able to make an extra half turn of the wheel to switch to having your stronger foot on the lowest of the 2 pedals! Riding on your Unicycle while Juggling. Make sure you have the unicycle skills such as turning, bunny hops etc before you try to add in the juggling side of things! If you have learned with 3 x balls, then consider learning with clubs, knives and fire clubs. Repeat the whole processes above (you should be pretty good at the Unicycling side of things by now!) If you can find a partner who can also juggle on a Unicycle then you have the possibilities of passing while juggling on a Unicycle. This is a lot harder than what you have just learned, but it’s also very impressive! Learn to Juggle while riding a Giraffe Unicycle! There is one other way to Juggle on a Unicycle. 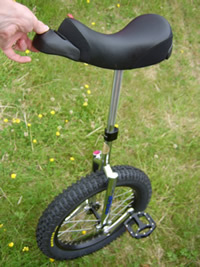 It’s an old joke but basically lay your Unicycle flat on the ground, stand on top of it, and do some juggling. It will hopefully make the crowd laugh and introduce a bit of doubt as to whether you have this amazing skill. You can then do it for real!